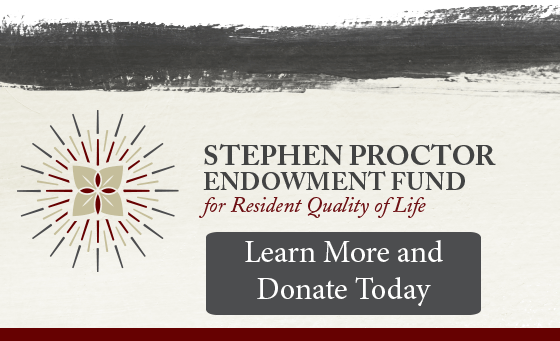 Learn more about the Stephen Proctor Endowment Fund for Resident Quality of Life, and submit your donation online. Why Should You Donate to Presbyterian Senior Living? Thank you for considering a gift to Presbyterian Senior Living or one of its communities. Your gift will make a difference and impact the lives of the people we serve and the employees that care for them. Your generosity matters to us – each gift is important. We will be diligent and accountable as good stewards of your financial support. To make a donation online, please complete the form to the right. We appreciate your gift of support. If you would like your donation to be designated to a specific community or community program, please fill in the additional information section. If you are making a general donation please be assured your funds will be used where they are most needed. You may opt out of future solicitations for fundraising by contacting the Office of Resource Development at 1 Trinity Dr East, Suite 201, Dillsburg, PA 17019, emailing ckulp@psl.org, or calling (800) 382-1385. Thank you from the staff and residents of Presbyterian Senior Living. Presbyterian Senior Living is a tax exempt organization by IRS regulations. Pennsylvania law requires us to inform you that a copy of the official registration and financial information may be obtained from the Pennsylvania Department of State by calling toll free within Pennsylvania, 1-800-732-0999. Registration does not imply endorsement.